32nd Edition : July 2016. Prices for slaughter cattle have edged up very slightly to about Rp43,000 per kg in West Java following the end of the Lebaran holiday period. The Indonesian government continues to get tough on beef prices with Director General of Livestock Services, Professor Muladno losing his job mid month. Reports suggest that this was a result of the failure of his Department to facilitate the importation of Indian beef in time for the end of Ramadan and Lebaran. While the initial import permission for 10 Indian abattoirs to export frozen buffalo beef to Indonesia was issued by the DG on the 8th of June, the complex mix of additional permits and licenses and various government documentation requirements and logistics have caused the actual importation to continue to be delayed. According to my advice, as of 11th of August, no Indian product has yet arrived in Indonesia. The Agriculture Minister also focused his attention on feedlotters early in July to “encourage” them to not raise prices of slaughter cattle during the festival period. See the wording below from a Jakarta press article on the 1st of July. Despite the Ministers warnings, prices in the wet market remained at around Rp130,000 per kg through the festival period with a brief spike to Rp150,000 at the beginning of Lebaran reported in a few areas. The only success for the Minister was the distribution of around 5,800 tons of “borrowed” beef to the public at a fixed price of a little under Rp80,000 per kg. I am told that these distributions went to plan although such a small volume would not make much difference to the many millions of consumers keen for a Ramadan bargain. 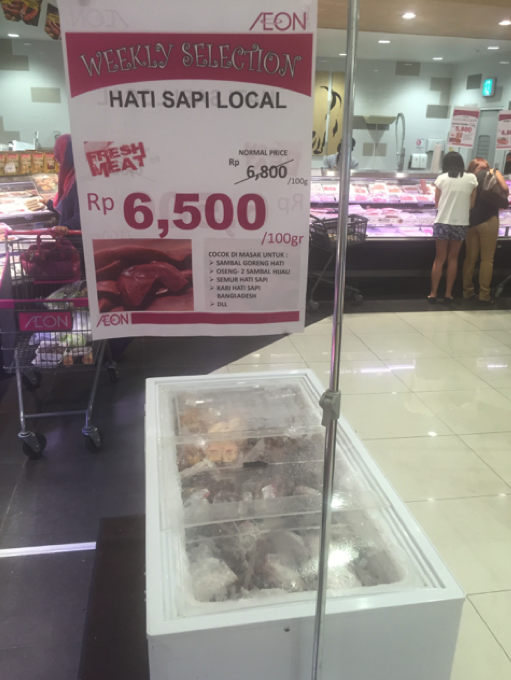 My Jakarta agents reported that their butchers told them that many customers asked for the low priced product which they had heard about in the press. Butchers responded by advising that they were not part of that distribution arrangement and were therefore unable to provide any discounted product. The government continues to focus on food prices. A recent Cabinet reshuffle produced several new Ministers commenting on how they intended to introduce policies to help reduce the price of key food items. Most of the comments focused on increasing supply of meat and offal that have been consistently restricted over the past 2-3 years. Perhaps the government has finally worked out that restricting supply of high demand products like beef is not a successful formula for lower domestic prices. One of the many initiatives announced was the 350 kg weight limit on imported cattle was being changed to a ship average of 350 kg which would allow the imports of some slaughter weight cattle. Unfortunately this announcement was ambiguous and needs official clarification of the exact wording and intent of the regulation before exporters will be comfortable turning up to an Indonesian port with cattle over 350 kg onboard. Uncertainty is the only way to describe the mood of the feedlot industry as it waits to see the outcome of Indian beef imports. Will it have the predicted uptake by bakso ball manufacturers? What proportion of retail customers will buy frozen product in the wet market? How will these issues affect their demand and how can they hope to make a profit while the price of imported Australian live cattle is rising but they are “encouraged” by the Minister not to raise their selling price? Photo : Japanese Wagyu selling in my local AEON mall for AUD$345 per kg for tenderloin and $295 for ribeye! And just two metres from this high priced wagyu above is some locally produced beef (which would be from Australian imported cattle) which is for sale at AUD $6.50 per kg. The product is frozen despite the “Fresh Meat” labelling. At least the public gets a full selection of product and prices to select from. Rates remain similar to last month despite the fact that demand was reduced during July as a result of the “Month of the Dead” which is a Buddhist Lunar calendar festival to remember dead ancestors. During this period, consumption of beef is traditionally much lower than usual. Prices in the north of Vietnam were as high as Dong73,000 with an average around D70k. In the south, D70k was the top price with an average of around Dong69,000 for top quality slaughter steers. Some discounting continues for overfat and poor yielding cattle as low as Dong66,500. Competition continues to come from Thai and Burmese cattle, many of which are claimed to be treated with illegal Beta agonists (salbutamol). The treatments result in very lean carcase with a high meat yield. The negative comments say that the meat tends to be dark and does not last well in the wet market environment so needs to be sold quickly before it goes off. 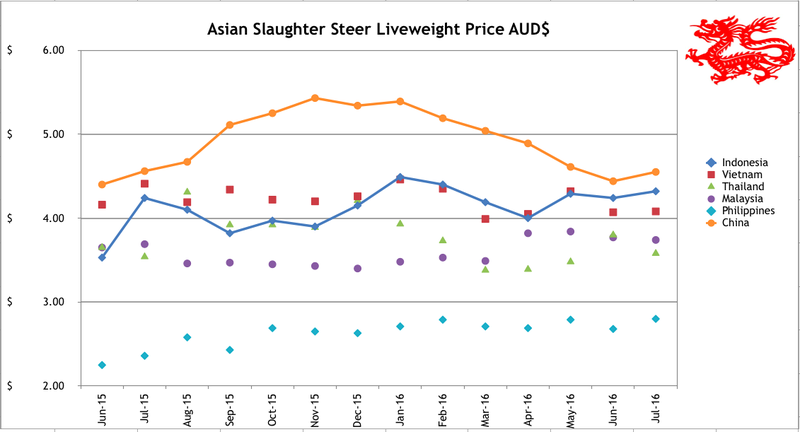 Despite these negative aspects, Thai and Burmese slaughter cattle sell for a premium of around 10 to 20 cents per kg live weight over Aussie cattle. The fact that they are not involved in ESCAS and can be slaughtered in any location across Vietnam is also a major selling advantage. Higher Australian cattle prices are yet to be passed on to the Vietnamese market as exporters do their best to absorb Aussie price rises in order to keep their ships moving. This is sure to come to a close soon, once ship time-charters come to an end. When demurrage bills no longer drive exporter decision-making then higher cattle prices will quickly be passed on to the Vietnamese importers. Despite this, Vietnamese entrepreneurs continue to bet on the long term future of this industry with ongoing construction of yet more and more feedlot capacity. The Vietnamese market continues to be disrupted by restrictions placed on some exporters, some importers and abattoirs by the Australian government (Department of Agriculture and Water Resources). These restrictions follow investigations of breaches of the ESCAS regulations where Australian animals were found to have been moved outside the approved supply chains. These investigations are ongoing so there may well be more restrictions to come. In the meantime exporters have been required to increase their level of monitoring of all abattoirs in Vietnam until future notice. It is interesting to note that while Vietnam is the world’s largest importer of Indian buffalo meat (about 800,000 tons annually) they consume very little (perhaps 5-10%) while the majority is exported to neighbours. Vietnamese prefer cattle beef over buffalo and are prepared to pay extra for it. This fact might give some hope to Indonesian feedlotters although the bakso market in Vietnam is nothing like that of Indonesia so it is still generally expected that Indian buffalo will capture a large share of the Indo market through bakso inputs. Local live cattle prices are softer this month despite reasonable sales through to the Vietnamese border. Domestic rates are struggling to get past 95 Baht per kg live weight. The Thai government continues to test local fat cattle for illegal Beta Agonists although it would appear that treated cattle are still able to make their way through the various border crossings to the Vietnamese market. A weakening Ringgit is the main reason for the small price movement in this month’s graph. The only price change of note was the cost of Indian frozen knuckle in the wet market has risen from Rg17.50 last month to 17.80 this month. Not clear if this is a trend or just a one off. 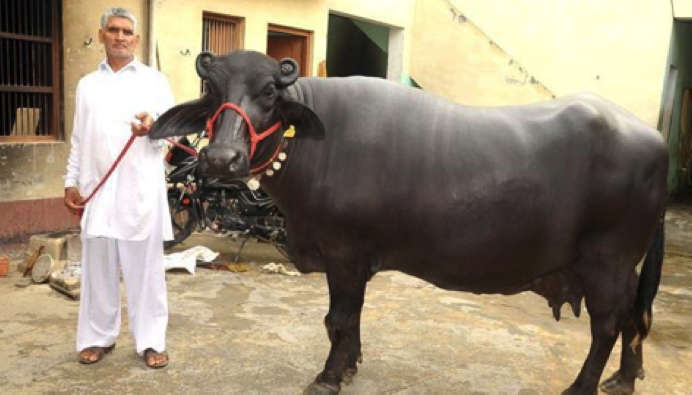 115 million head of Indian dairy buffalo are the basis for the buffalo beef industry. The price rise for local slaughter cattle is a combination of an actual rise in the Peso price plus a weakening of the local currency against the AUD. Local prices for slaughter steers have climbed from 92-95 Pesos per kg live weight last month to around 100 Pesos at the end of July. Local prices for wet market and supermarket beef have also increased by similar margins. The general feel reported by my agent is one of optimism driven by a buoyant economy and strong public approval of the crackdown on corruption, general crime and drug dealing across the nation. 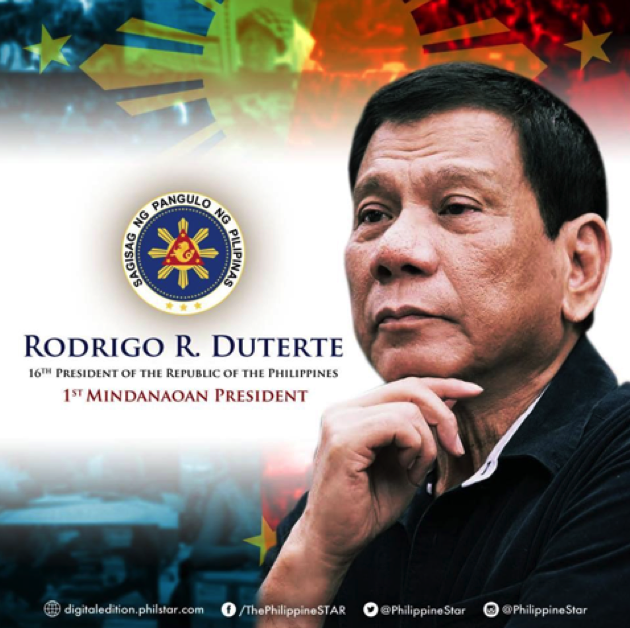 This prime Presidential policy continues to be prosecuted with enthusiasm by the authorities (and death squads) while enjoying very strong public support. 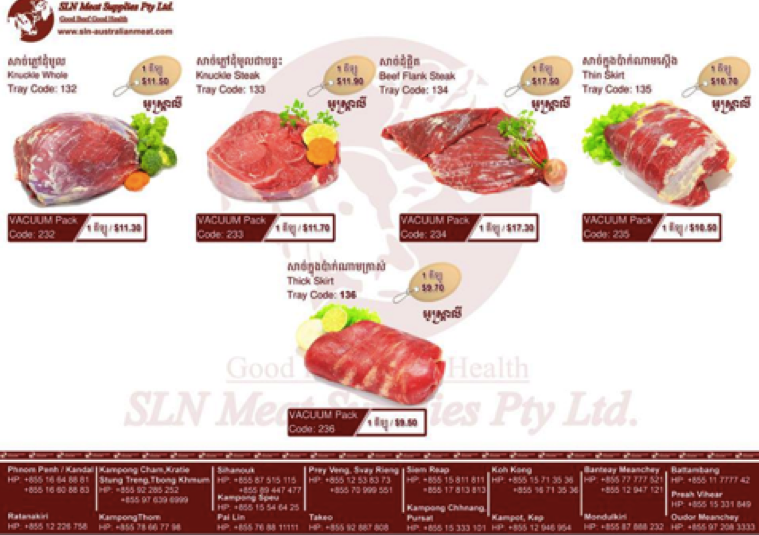 Cambodia : SLN Meat Supplies Pty Ltd are now producing first class product for the Cambodian market. The new SLN abattoir and feedlot business in southern Cambodia is under way with the first sales of product available in western style meat outlets at about 18 locations around the country (see the list of outlets at the bottom of the promo below). As of next month SLN will be a contributor to this report providing a monthly market summary to increase the number of SE Asian countries covered by our regular monthly price update. This month Fox Lumsden has provided the two photos below. Photo by Fox Lumsden : Phnom Penh wet market USD$9.50 per kg. 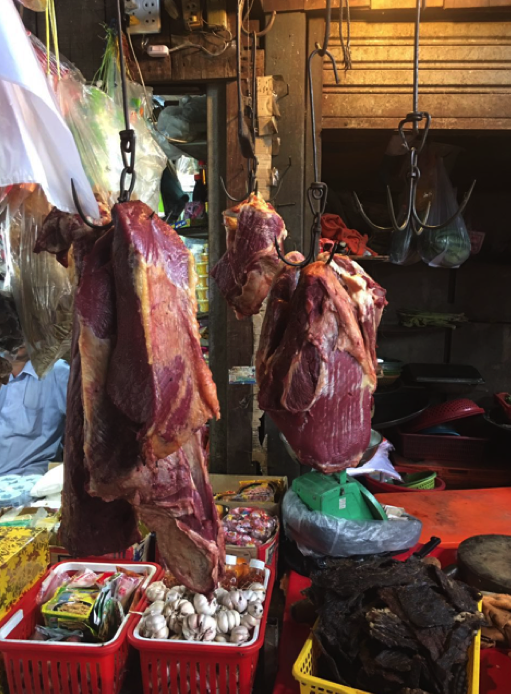 The wet market beef in the first picture is selling for US$9.50 per kg in Phnom Penh while the SLN western style product presentation (on facebook) is selling vacuum packed whole knuckle for US $11.30 per kg. Photo : SLN’s facebook advertising provided by Fox Lumsden. The price rise in AUD is primarily a currency affect with Beijing prices only moving from Y22 per kg live weight last month to Y23 this month with no change in Shanghai. The dominant feature of the market remains the oversupply of cull dairy cows. My agents report that nearly half of all dairy farmers, including large companies cannot make a profit in today’s environment due primarily to consistently low milk price. In addition, quality beef imported from Australia is selling for Y108 in the supermarket. Local producers offering their product for Y92 to Y98 are unable to compete with the Aussie product which is much more favoured by Chinese consumers. ← Indian beef is about to capture a large slice of the Indonesian market.